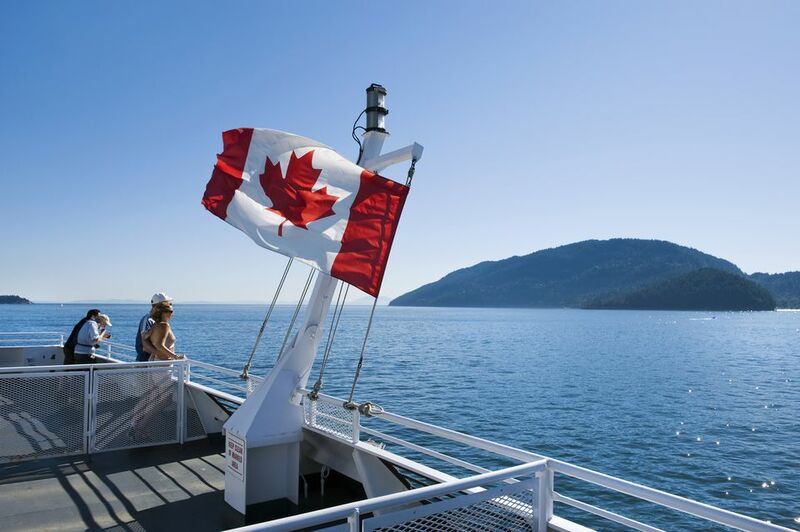 A Kid-Friendly Daytrip to Bowen Island, BC. Bowen is a small island off the coast of Vancouver, BC, just a 20-minute ferry ride from Horseshoe Bay, and a great day outing from Vancouver. Horseshoe Bay is a 30-minute drive north from downtown Vancouver, on the West Coast of Canada. Bowen offers natural beauty, a small-town community of 4,000 people, and the highest number of kids per capita in Canada. Snug Cove, where the ferry docks, offers kid-friendly restaurants, a health food store, general store, pharmacy, and miscellaneous small shops. Three minutes from the Cove by car, or a 15-minute walk, is Artisan Square, home to another restaurant, chocolaterie, and several shops. The island is a fun place to go hiking or kayaking or to simply hang out at the beach. Stroll the boardwalk: Near the ferry terminal is a boardwalk and grassy area adjacent to several Snug Cove shops and restaurants. Little kids can run around and interact with the Canada geese. In summer, eat at the cute Paradise Grill hot-dog stand, and then buy ice cream at The Chandlery a few steps away. Visitors in summer will also find a Sunday Market where jewelry, crafts, and snacks are for sale. Go for a hike: Many people come to Bowen to hike in 600-acre Crippen Park. If you have a car, drive to the Killarney Lake area of the park. With small kids, the hike around the lake will take about an hour, including a few breaks. Alternatively, just set off on foot from the ferry dock. Check the map posted at the park entrance. Within a few minutes, you can reach a pretty waterfall (and a salmon ladder where you might see the upstream swimmers in the late fall) before the trail continues onward to Killarney Lake. Hit the beach: As you come off the ferry, turn right at the first road, and you'll find a sandy beach area. Kayaking: Paddling is a good activity with older kids; Bowen Island Sea Kayaking, just steps from the ferry dock, rents kayaks and also stand-up paddleboards. Sailboat charters are also available. Check for recreation companies and services at Bowen Online. Biking: Bikes can be brought over on the ferry, but be prepared for lots of hills. Entertainment: Bowen Island also offers occasional local theater and musical events, and the annual local bash, Bowfest, takes place the last weekend in August every year. BC Ferries operates the ferry; check the schedule and fares. For Bowen Island, the ferry fare is paid only one-way. Plan to arrive half an hour before the sailing, especially on busy weekends, because this popular ferry can fill up fast. Be aware that finding a parking spot in Horseshoe Bay can be difficult in summertime, so allow extra time. Alternatively, families could take the #250 or #257 bus to Horseshoe Bay -- see the Translink site. Foot passengers pay much less than travelers with a car. Tip: if you miss the Bowen Island ferry departure, at Horseshoe Bay, park your vehicle in the ferry terminal to wait for the next sailing; then take your ferry ticket with you and walk over to the ice-cream stores and playground in Horseshoe Bay. Bowen offers several bed and breakfasts and other modest accommodations. The Lodge at The Old Dorm occupies a heritage building near a beach and Snug Cove.